The WolfPack volleyball team celebrates winning the NJCAA Division II Regional IV Tournament in Rockford, Ill., on Nov. 2. Madison College’s top-ranked volleyball team hasn’t lost a match since Sept. 20. In fact, the team has only lost three matches all season. So the squad had to be concerned when it trailed rival Harper College, 2 games to 1 in the championship of NJCAA Region IV Tournament on Nov. 2 in Rockford, Ill. But tough times seem to bring out the best in good teams. 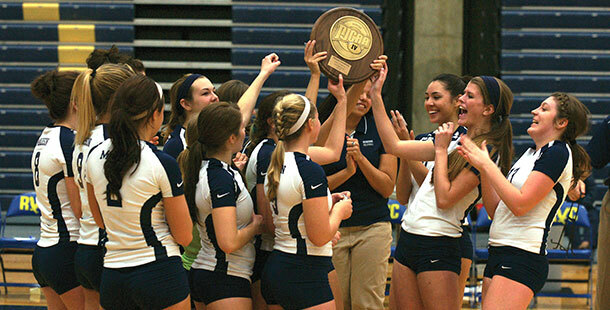 On the brink of elimination, Madison College rallied to win the two most important sets of its season, 25-20 and 15-12. With the victory, Madison College advances to the NJCAA Division III National Championship for the first time since 2009, when the WolfPack finished second in the nation. In the championship match, the WolfPack was led by All-American hitter Terissa Bierd, who had 20 kills, and setter Hannah Grahn, who had 50 assists. Vanessa Clarson led the way defensively with 34 digs. Madison College reached the championship match by sweeping the College of DuPage in three games, 25-12, 25-18, and 25-18. Freshman Mikayla Nigl led the way against DuPage with 13 kills and two blocks, while Grahn added 34 assists and Clarson had 17 digs and two aces. Madison College is now 31-3 overall and has won 18 consecutive matches. The national tournament will be held in Rochester, Minn., starting Nov. 15. Although it’s ranked No. 1 in the nation, Madison College will have to wait until Nov. 11 to learn where it will be seeded in the national tournament. Information about the national tournament is now posted on the WolfPack athletics web site at madisoncollegeathletics.com.